Frances and Michael Howorth look at the many new bridge systems and displays the superyacht owner must consider and investigate, total cost of ownership, support and future proofing, asking are we pushing the boundaries of new product design? for the engineers it is often the control room while the ITO’s get into a sweat just thinking about the racks in the AV room. But for the navigators there is only one space where form meets function with any real degree of practicality and that is the navigation bridge. Often called the yacht’s control centre by those that man it, many also call it the nerve centre adding with a certain amount of irreverence that it is where the Chief Nerve works. Whatever your job on board it is considered to be by many on board the focal point of the yachts working purpose. The modern day bridge with its controls, multifunctional computer screens clustered around the steering and propulsion devices can impress some, baffle others and elicit scream of despair from others. What has been designed with great care and forethought by one person or even a team of people can, at a stroke immediately win the approval of those who are going to use it or can generate much striking of the head as the potential user stares at it in amazement and asks him or herself what the devil is that doing there. 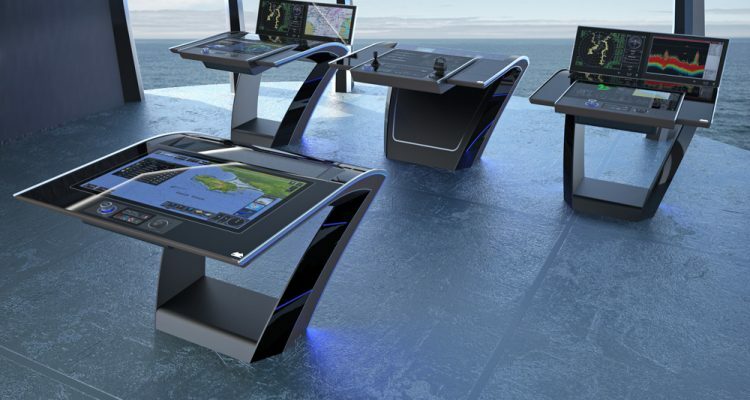 But is ECDIS all that its cracked up to be? 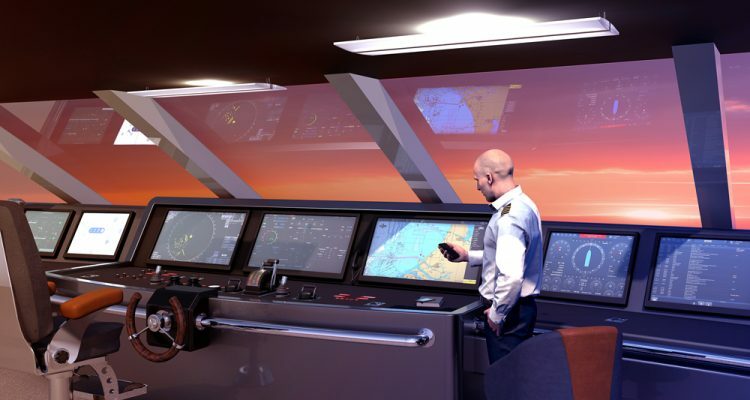 RH Marine in Holland believe that although ECDIS has brought a lot of ease to the bridge, sometimes it can be a challenge for a navigator to sail without the familiar large paper chart. They say, “It may be the lack of a good overview, or the limited freedom to add notes or other content. Fortunately there are modern technologies available that can assist here. The Rhodium Bridge suite of applications already contains its own developed chart system for a long time, running on each of four navigation Multi-Function-Workstations at the bridge, so fully redundant and according the applicable regulations.” A recent addition from the company is their Voyage Planning Station (VPS), adding just the functionality to fill the gap. Yet newspapers and consumer affairs Web site still proclaim that the possibility of hacking a ECDIS remains a potential threat to superyachts. Ken Munro of Pen Test Partners a company offering Cybernet Penetration Testing Services has suggested that the vulnerability of ECDIS could be exploited to block superyacht ports and wreak havoc throughout the superyacht community. His statement comes after his firm looked into shipping using the English Channel, which is the busiest shipping route in the world. Munroe found a commonly used ship-tracking technology can be hacked to spoof the size and location of boats in order to trigger other vessels’ collision alarms. He told the BBC that a researcher has discovered that it was relatively easy to find cases via an app to gain remote access to the ECDIS System on ferries crossing the channel. In the world of superyachts it is all about aesthetics and it is obvious that design is very important. A bridge lay-out is always subject to customisation by the Owner’s team. However most important is to ensure safe and efficient sailing. RH Marine share the opinion that ‘less is more’ by keeping mimics simple and clear with the right information at the right spot. By being involved at the design phase of the bridge console the company ensure that the operational goals meet the customers demand for safety and comfort and obviously the requirements of rules and regulations. 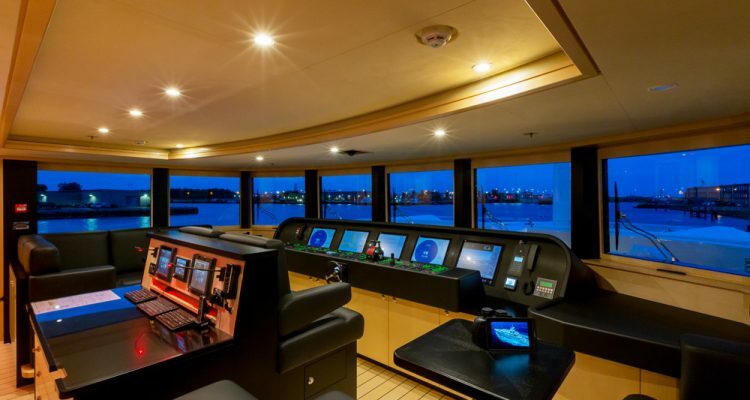 As integrated bridge systems (IBS) for superyachts advance substantially in both usability and aesthetics, marine electronics specialists Admarel B.V., an Alewijnse Marine company. realised that superyacht owners they work with typically expect something that both looks good as well as ensures a safe and compliant cruising experience. Malou Bense the company’s marketing communications manager believes, “The sheer diversity of navigation, communications and control systems often means that even the latest bridges end up with a range of independent stations, each catering to a different system and each with its own operating manual and training requirements. Admarel believe that their goal has been achieved with the arrival of the Synapsis NX integrated navigation system (INS) from Raytheon Anschütz. Despite the name, the Synapsis NX is about much more than just navigation. It goes beyond what most captains would regard as an IBS adding a fully flexible IT network that will receive and distribute data and commands from anywhere and to anywhere it is needed not necessarily limited to just navigation. I-Bridge Air Wings is a new system from Onyx Marine Automation part of the TEAM Italia Group. It provides for integration of the 3D. Federico Sturlese, the firms CTO, says, “The 3D monitoring we developed tracks out a new route on the panorama of supervision systems, guaranteeing unprecedented levels of usability. The innovative three-dimensional graphics are perfectly integrated into the I-Bridge® system and enhance its versatility, efficiency and design,” affirms Captain David Clarke was for many years the Master and Commander of the 73 metre Delta Marine built Laurel. That was before he and his wife, the yachts purser, stepped ashore to set up Superyacht Operating Systems a powerful standard operating procedure system featuring tools superyacht crew need to complete seamless digital tasks, checklists, work lists, procedures and calendars not just for the bridge but the entire superyacht. Bridge Management might look very different on a 30 metre as compared to a 130 metre but when you break it down the basics are all the same. Good Bridge Management is a combination of the right team, the right equipment and the right tools, and without all of them working in harmony, Bridge Management can easily turn into Bridge Mayhem. The right team consists of the following, The Decision Maker, The Helmsman, The Plotter, The Radio Officer and The Lookout. Often one person will carry out multiple roles during a Bridge watch and when the conditions are presented it might be required that five or more persons carry out just one role each. Nether the less all these roles make up the Bridge team and weather it’s a team of one or a team of five working in harmony, the right team in the bridge is what makes up the first component of good Bridge Management on board any vessel. HOW ARE DESIGNERS AND TECHNICIANS GETTING TOGETHER TO CREATE A SAFER AND MORE ERGONOMIC NAVIGATION AREA? Omega Architects who work with Dutch shipyards the likes of Heesen have worked on a bridge layout concept for an 80 metre yacht that shows the latest thinking on the efficient use of space and which integrates the main functions; navigating, planning and lounging within a spacious, futuristic environment with sleek floating elements. They have done so working with Dutch marine electronics specialists Admarel and Bricks & Goggles, a leading VR agency specialising in visualising construction and fit-out projects prior to a yacht build starting. The three partners together understand the two very different approaches – design and technology – that need to be reconciled and the benefits that would be gained as a result. The key objective was to make the look and feel of the working environment and the accompanying ergonomics the start¬ing point for the design of the bridge, and then taking advantage of the new flexibility of the technology to create bridge concepts that are both design statements in their own right and highly efficient command and control centres. Traditionally, bridge design has been determined by regulatory requirements first and the technology second, with aesthetics coming a distant third. The development of integrated bridge systems was expected to revolutionise the way bridges looked and operated, but up until now that process has been slow. The additional space offered the opportunity to create an attractive, well positioned place to manage and organise everyday life and business organisation on board of the yacht.